Pour the flour into a large mixing bowl. Slowly stir in the hot water, until your mixture reaches a play-dough like consistency. Time to get your hands dirty! Knead the dough, pushing in with the palm of your hand, until you get a smooth finish and elastic feel. (Tip: if the dough is sticking too much, sprinkle a little flour on the worktop or on the dough itself). Shape into a ball and leave to rest for 5-10 minutes. While the dough is resting, combine your spring onion and ginger in a bowl. Boil water in a large saucepan, and then place a bowl on top. Place your clarified butter into the bowl to slowly melt it through. Add star anise as the butter is melting to separate the fat from the liquid butter. Use a spoon to skim the solid butter, and then set the butter aside to cool. In a frying pan, heat the butter to a high heat and then add the spring onion and ginger. Give it one stir through, add a pinch of salt, and then remove from the heat. Pour into a bowl. Roll out your dough into a rectangle. Get it as thin as possible, adding flour to the rolling pin and worktop if it is sticking. Get your bowl of filling. Spoon your spring onion mixture onto your rolled dough (Tip: hold your spoon of filling against the side of the bowl to drain the excess butter before placing the mixture onto the dough). Spread the filling evenly across the dough, leaving 2-3 centimetre margins at each edge. Fold in each side of dough to make a square before then rolling it into a cylinder. Twist this into a spiralled, snail shape to add layers to your dough before then rolling it flat again. Place your chopped spinach onto your rolled dough, again leaving a 2-3 centimetre margin at the edges. Fold each edge into the centre and then give your dough its final roll. Heat an empty frying pan until hot (no need for extra oil!). Place your pancake carefully into the pan and let it cook for 3-4 minutes, until golden brown on the under side. Turn over and do the same, ensuring both sides are a gorgeous golden brown. Remove from heat. Mix Chiu Chow chilli oil, light soy sauce and Chinkiang black rice vinegar in a bowl with a dash of sesame oil and sugar. 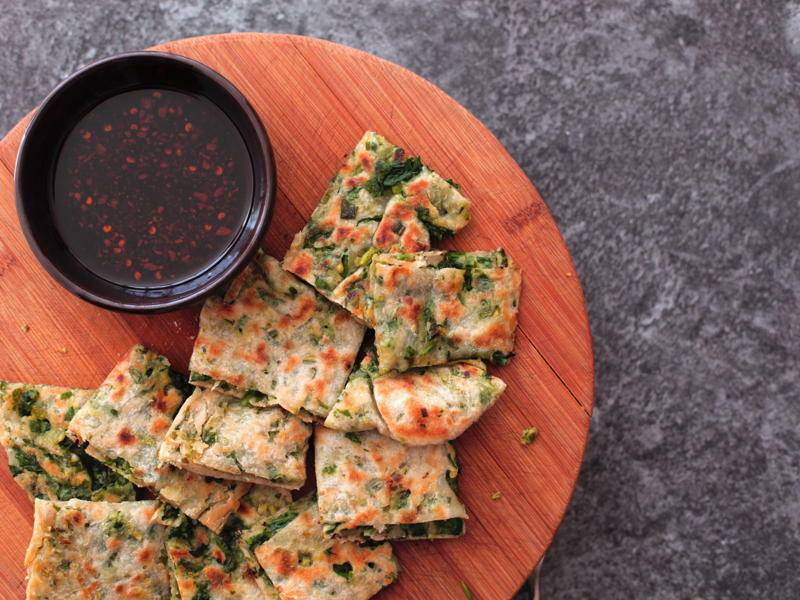 Chop your pancake into squares and serve on a plate, accompanied by your dipping sauce. Enjoy as a snack with 6-10 others!